Cardiovascular training, also known as aerobic training or simply cardio, is a type of exercise which aims at making muscles more resilient. The purpose of it is also to better the functions of the heart and the lungs in delivering oxygen to the muscles. The effects of cardiovascular training on burning calories are significant, which is why it is recommended for obtaining and preserving a healthy weight. One of the best sides of this cardiovascular training is that it affects many muscle groups and also speeds up the heart rate for a prolonged period (at least 30 minutes). Experts claim that it should become part of the routine of everyone concerned about their health. If you wonder about its frequency, three times a week, for a minimum of 30 minutes each time, will work. Power walking, running, swimming, biking, aerobic dance and step are among the most widespread elements of cardiovascular activity. Is there anything better than practicing one of these elements? Yes! This is practicing two or more! This is generally called cross-cardiovascular training. If you wish to burn fat through cardio exercises, your target heart rate should be between 60 and 70% of the maximum heart rate. Beginners are usually advised to start with something like 50% of the maximum. 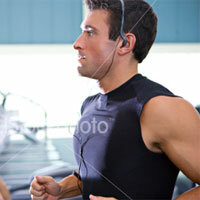 When the target heart rate reaches 50 to 70% of the maximum one, approximately 85% of the calories burned come from fat. If instead of burning calories you aspire to boost the performance of your cardiovascular and respiratory system (make yourself more resilient, in other words), your heart rate should lift up to 70-80% of the maximum. There is yet another positive thing about cardiovascular training here: it actually increases the size and the strength of your heart. To be able to estimate the cardio heart rate that will work for you, you need to measure your resting heart rate first. The morning hours are ideal for this purpose as the body is then closest to its state of rest. Use your index and middle finger to feel your pulse on the throat or the inside of the wrist. A common mistake in measuring the pulse is using the thumb but it has a pulse, too. A watch with a second hand will help you count the number of heart beats in ten seconds, which you should then multiply by six. To be really sure you did it the right way, repeat this process on three consecutive mornings and estimate the average result. The maximum heart rate is what you get when you subtract your age from 220. By subtracting the resting heart rate from the maximum heart rate you get what is called ‘heart rate reserve’. Then, you are ready to settle the range of your target heart rate taking into account what you’d like to accomplish. Multiply the maximum and minimum levels of your target heart rate (for instance, 60 and 70%) by your ‘heart rate reserve’. After that, add your resting heart rate to each figure to find what the maximum and minimum beats per minute of your target heart range are. Cardiovascular training is efficient only when maintaining the same rates. This is why it is essential to pay attention to your heart rate while exercising. You can do this either with the help of a cardio machine, or simply with a wristband. If you have neither of these available, you can still use a clock with a second hand or a stopwatch and take your pulse at regular intervals although it will take you much time and effort.